Researchers have created nanoparticles that selectively kill hepatoma cells and reduce growth of liver tumors in rats, they report in the February issue of Gastroenterology. They show that the particles induce tumor-specific necrosis by selectively disrupting redox balance within cancer cells. Dietary intake of the natural omega-3 fatty acid docosahexaenoic acid (DHA) has been reported to protect patients with viral hepatitis from developing hepatocellular carcinoma (HCC). However, little is known about the effects of DHA on established solid tumors. 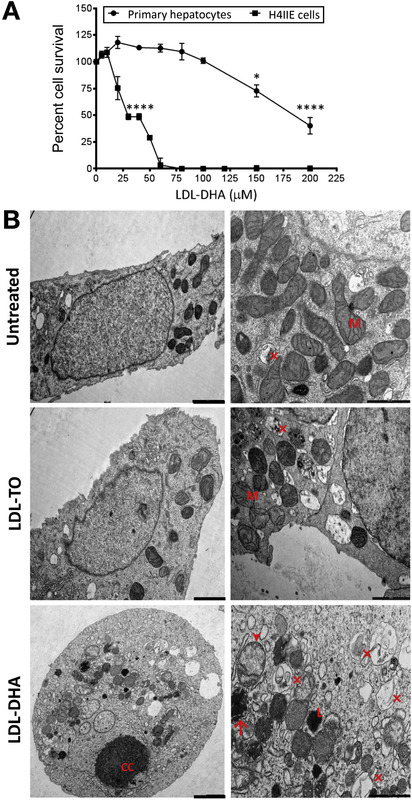 Xiaodong Wen et al describe a low-density lipoprotein-based nanoparticle that transports unesterified DHA (LDL−DHA) and has selective cytotoxicity toward HCC cells. They investigated the ability of LDL−DHA to reduce growth of hepatomas grown from intrahepatic injections of rat hepatoma cells. 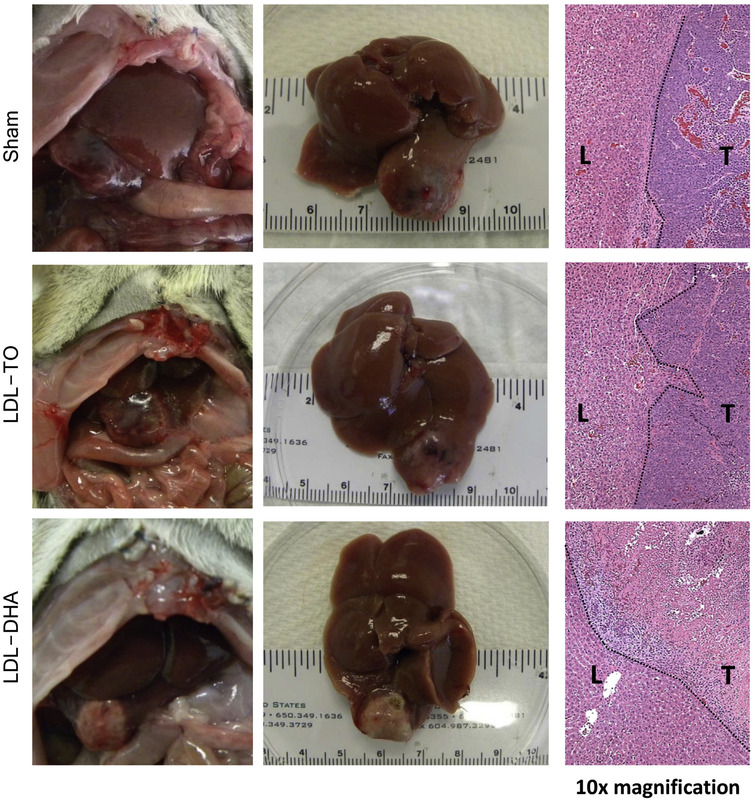 Rats with a mean tumor diameter of approximately 1 cm were given a single hepatic artery injection of LDL nanoparticles loaded with DHA (LDL−DHA) or triolein, or underwent a sham surgery (controls). First, Wen et al showed that the LDL−DHA (60 μM) killed cultured malignant hepatoma cells but did not affect primary hepatocytes. Rats given the single injection of LDL−DHA had smaller, pale tumors that were devoid of vascular supply and more than 80% of the tumor tissue was necrotic. 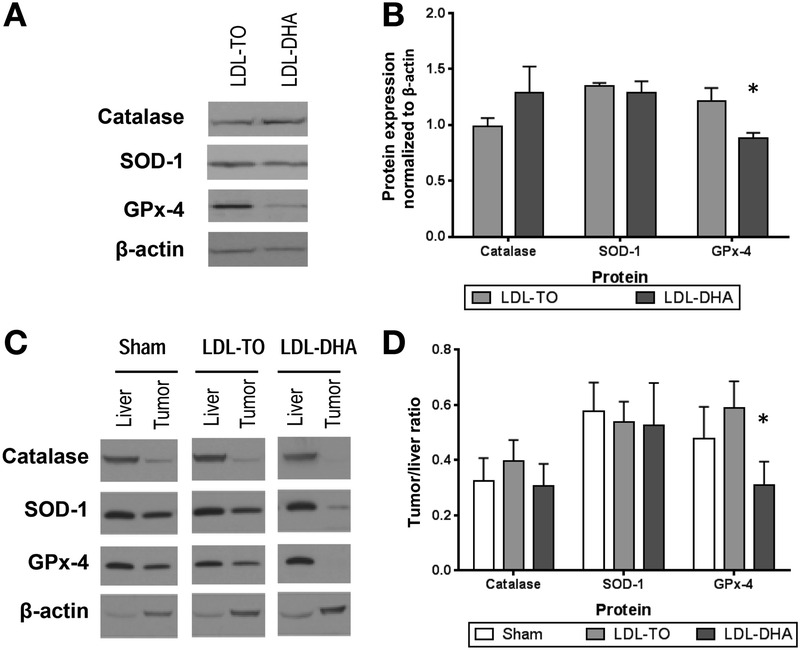 Four to 6 days after injection of LDL−DHA, the tumors were 3-fold smaller than those of control rats. The liver tissue that surrounded the tumors showed no histologic or biochemical evidence of injury. Wen et al also showed that the LDL−DHA deregulated redox reactions in tumor tissues by increasing levels of reactive oxygen species and lipid peroxidation, depleting and oxidizing glutathione and nicotinamide adenine dinucleotide phosphate (NADPH), and significantly down-regulating the antioxidant enzyme glutathione peroxidase-4. The authors were surprised to find that the redox balance in the surrounding liver was not disrupted. 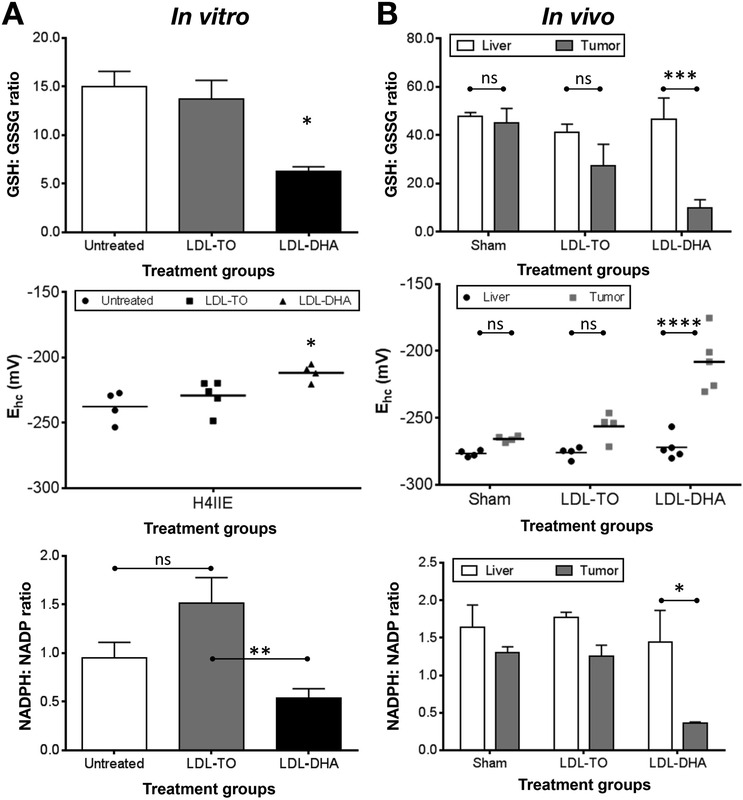 Serum markers of hepatocellular injury, alanine aminotransferase, and aspartate aminotransferase were significantly lower in the rats given LDL−DHA than in controls. This finding is important because most chemoembolic treatments delivered via the transarterial route to HCC also cause injury to the surrounding liver and in rare cases, lobar atrophy, or even fatal liver failure. Wen et al conclude that reformulation of DHA into an LDL nanoparticle expands the utility of this omega-3 polyunsaturated fatty acid, enabling its use as an anticancer agent. 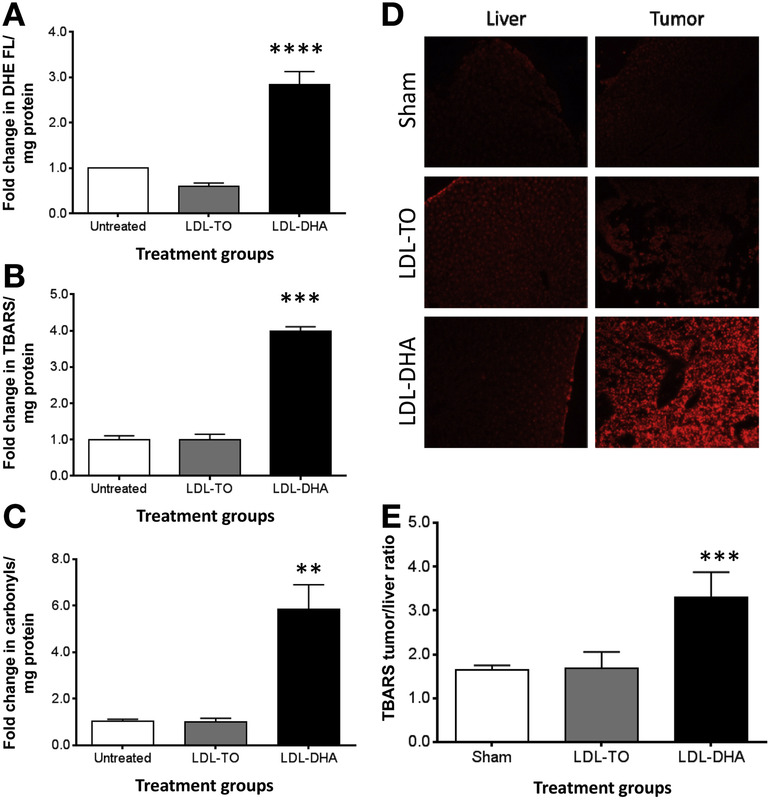 Transarterial administration of LDL nanoparticles delivers DHA to tumors at sufficiently high concentrations to induce significant tumoricidal effects, with no evidence of injury or hepatoxicity in the surrounding liver. The researchers are planning longer-term survival studies to evaluate effects of repeated LDL−DHA administration. In an editorial that accompanies the article, Riccardo Lencioni and Filip Braet explain that it was important that the authors used a hepatic transarterial approach, which minimizes the drugs systemic exposure yet ensures adequate concentrations of LDL NPs in the tumors. Lencioni and Braet say that more information is needed on the potentially synergistic effect of systemic, molecular targeted agents such as sorafenib and LDL–DHA nanoparticles. Building on the current transarterial administration route, alternative methods to deliver nanoparticles to the tumor should be considered, such as the tortuous arterial and venous hepatic microcirculation. Lencioni and Braet propose covalently attaching a fluorescent tag to LDLs to assist surgeons in administering nanoparticles to tumors or resected areas, via intraoperative fluorescent navigation imaging technology (see figure).